A holdout problem must require assembly, which is the need for at least two distinct properties for a development. There is a possible relationship between the holdout problem and urban sprawl suggested by the fragmentation of ownership in urban areas spatial variation in the fragmentation of ownership in urban areas…this is because lot sizes are generally smaller towards the center of cities and become larger as you move away from the heart of the city center. As a result assembly in the middle of the cities generally requires more participation for a given area then at the fringes of a city. A developer needing to acquire two adjacent, individually owned lots. We assume that bargaining between the two parties, the developer and land owners takes place in one of two periods: now (t=1) or later (t=2). The developer can only proceed with development if he (a) acquires both parcels of land in t=1 (b) acquires one parcel of land in t=1 and the other in t=2 or (c) acquires both parcels in t=2. If the developer is unable to acquire all (two) pieces of land then he is forced to scrap the project. In this model the lot owners have the option to wither “bargain,” selling their property to the developer, or “hold out,” not selling their property to the developer in t=1, 2. 2v = the combined values of the two properties of land to the individual owners. So v is the value of one property to one owner. Net return from the single parcel is v – P1 because the development was scrapped because the developer was not able to acquire both plots of land. So the net gain from acquiring the second parcel of land in t=2 is V – ε – P1 – P2 – (v – P1) which when set equal to zero yields P2 = V – ε – v. Obtaining the second parcel of land allows the developer to proceed with his land development and attempt to obtain the profit he expected. 1. Sellers would prefer to sell jointly in period one as opposed to period two, because the later involves a delay, ε. This delay causes the overall profit of the development to be decreased. 2. It is better for a seller to be the lone holdout in period two, as opposed to the case where both sellers holdout and sell in period two, as seen by P2 > P*. This is the same as the classical prisoner’s dilemma problem where both owners are better off selling out promptly, but each individually has the incentive to delay selling. 3. It is unknown if being the lone holdout or selling jointly in period one is better, because while the holdout has superior bargaining power, the available surplus in period two is smaller due to the cost of delay. The ambiguity comes from the relationship between ε and (V-2v)/2. 5. The overriding takeaway form this model is that costly delays can arise in projects involving land assembly. We can assume that the more parcels of land necessary for a certain development will make assembly even more difficult, and thus lead to more costly delays. So developers will prefer locations where ownership is less dispersed, all else equal. Lot sizes decrease towards the city centers for two reasons: 1) increasing land prices toward the city center cause housing producers to substitute land for capital and 2) increasing housing prices toward the city center also cause the demand for housing to decrease. Due to these two reasons there is greater population density nearer to the city center. Which we can reasonably extrapolate from and say that ownership of a piece of land of a given size is more dispersed the closer it is to the city center, meaning that more people own a given area of land the closer the closer this area of land is to the center of the city. i. Developers can maintain their secrecy about projects by utilizing dummy buyers to help acquire assemblies. This would be useful because sellers would not know that a single buyer is attempting all of the land in a certain area. This is more difficult for government-backed projects because they often require openness. ii. Governments can create incentives or subsidies for building in city centers or disincentives for building in the suburbs. The justification for this can come from redevelopment of central areas. iii. The use of eminent domain, but this often raises issues about whether or not a private organization should be able to benefit from the use of eminent domain. Miceli, Thomas J., and C. F. Sirmans. “The Holdout Problem, Urban Sprawl, and Eminent Domain.” Journal of Housing Economics November 16.3-4 (2007): 309-19. Web. 1 Mar. 2014. A number of scholars including Krugman, Romer, and Lucas support the importance of concentration of people and firms as the most important factor for economic activity (410). Concentration creates knowledge spillovers, which are the transmission of knowledge “through face-to-face interaction and through frequent contact” (411). Scholars disagree over the significance of knowledge spillovers within and across disciplines, but it is widely accepted that physical proximity is key for the transmission of “sticky knowledge,” or that which is highly contextual (411). Knowledge spillovers create increasing returns to scale within a geographically bounded space, primarily the relatively compact area of cities (410). An important question to ask in relation to agglomeration economies is “does the specific type of economic activity undertaken within any particular geographic region matter?” (410). This opens the debate to two options: a geographic region that specializes in a particular industry, or a geographic region with diverse firms and economic agents. In order to answer this question, Feldman and Audretsch attempt in this paper to classify the extent of diversity or specialization in geographic regions and then measure “how this composition influence innovation output” (410). In this paper Feldman and Audretsch use data from the United States Small Business Administration Data Base as a direct measure of innovative output. This database is composed of product innovations, each with a four-digit standard industrial code (SIC). Limitations to this data include the emphasis of product innovations over process innovations, variation in the quality of innovations, and the necessity to treat all innovations as homogenous (414). By attributing each SIC to a Consolidated Metropolitan Statistical Area or Metropolitan Statistical Area, the researchers are able to rank cities in terms of gross quantity of innovation. 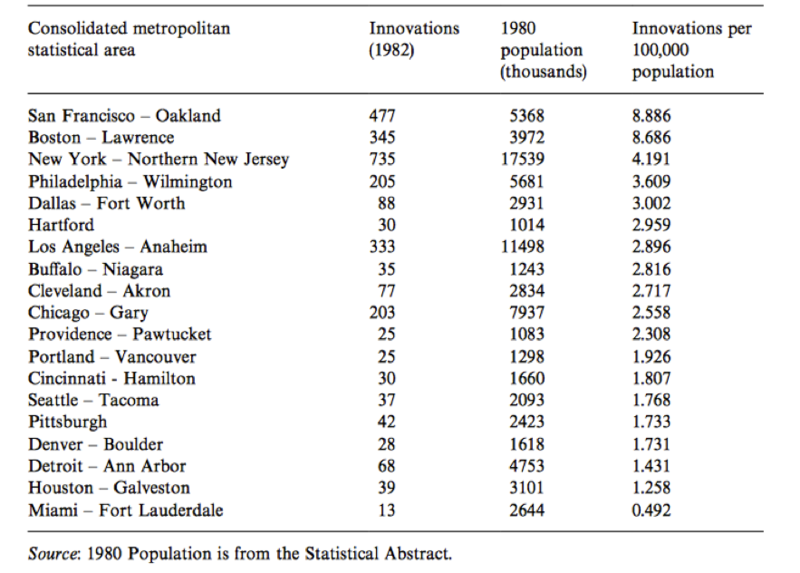 The results are exhibited in Table 1, which shows that the most innovative city in the United States in 1982 was New York. It is also important to note the overwhelming source of innovation is urban areas, with less than 4% of all observed innovations occurring outside of metropolitan areas (415). For reference, 70% of the population at this time lived outside of metropolitan areas (415). The table also uses population statistics to provide a more accurate calculation of innovation, finding San Francisco with the highest innovation rate per capita (415). Feldman and Audretsch then attempt to link “products on their closeness in technological space” (415). 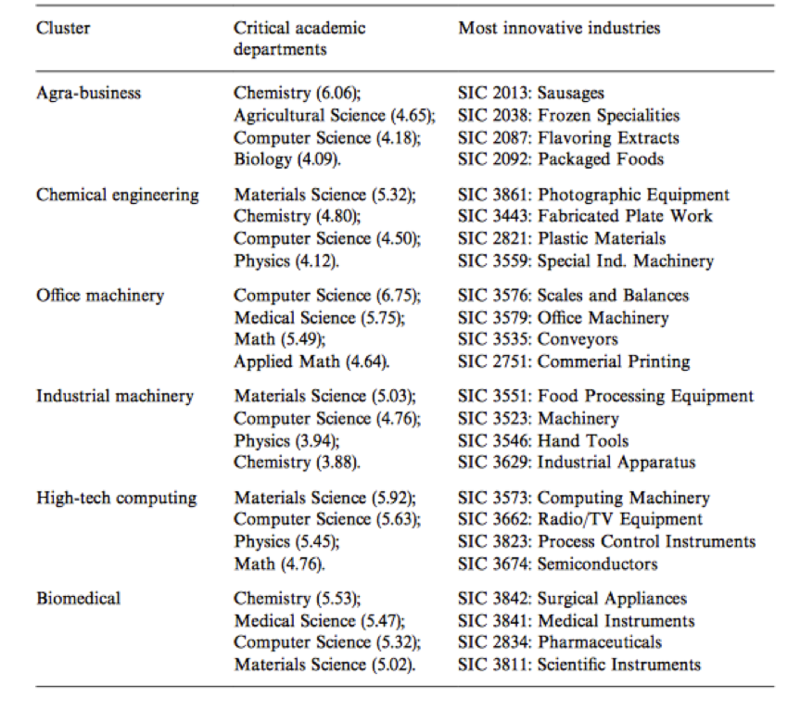 To do so they utilize the relevance ranking scale in the Yale Survey of R&D managers to establish groupings between industries that share a common scientific base. The results are shown in Table 2. 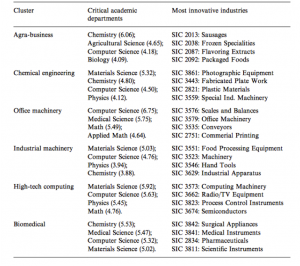 The researchers find that industries that rely on a “common science base” exhibit a tendency to cluster together geographically with regard to the location of employment and innovation (418). This is the initial information that the researchers use to create a model for determining the effect of a variety of factors on the quantity of innovations in different locations. Feldman and Audretsch establish the dependent variable of their analysis as the number of innovations attributed to a specific SIC industry in a particular city. They isolate three explanatory variables: a measure of industry specialization, a measure for the presence of science-based related industries, and an index for localized competition (419). The equation, mean, and standard deviation for these three variables are exhibited in Table 3. Feldman and Audretsch’s results are shown in Table 4, titled Poisson estimation results for the Poisson regression estimation method. This method was selected because to model count variable because “the dependent variable is a limited dependent variable with a highly skewed distribution” (420). This means that the events represented by the data are somewhat rare. This type of distribution can be used for cancer, cases, number of accidents, or number of bird sightings, but in this case is used for counts of product innovation (Schwartz 1466). The first column (Model 1) provides results for the three independent variable measures (specialization, science-based related industries, localized competition). For industry specialization, the negative and statistically significant coefficient suggests that cities that specialize in economic activity in a certain industry have a lower rate of innovative activity. For science-based related industries, the positive and statistically significant coefficient means that innovative activity is correlated with a strong presence of complementary industries sharing a common science base. Finally, the negative coefficient on the third variable, localized competition, suggests that innovative activity of an industry is actually associated with less localized competition. To translate these correlations: the results provide support for diversity in spurring innovation as opposed to specialization spurring innovation (421). There are a few potential drawbacks to using this model. The first is of city size; that large cities might be expected to have more innovation purely as a result of advantages in total manpower and resources. There may be a greater degree of economic activity and localized competition. In the second column of Table 3 (Model 2), total employment is normalized and the results for the third variable change. This new positive coefficient means that localized competition is, in fact, conducive to innovative activity. The other two coefficients remain unchanged. Another concern with Model one is the variation in innovation across industries. In the third and fourth columns (Models 3 and 4), the number of innovations recorded for the specific industry is controlled. The basic results remain the same. The answer to the debate of specialization versus diversity prompts two different policy implications. If innovation is fostered more effectively in specialized economies, policymakers should “focus on developing a narrow set of economic activities within a geographic region” (410). However, since the opposite is true and diversity prompts innovation, policymakers should attempt to “identify commonalities and foster diversity” within the geographic region (410). The specialization versus diversity question draws parallels to two types of modern development: university research parks versus the traditional urban form. According to this study, the diversity of work types that occurs in a traditional urban setting is more innovative and therefore more economically productive than a more focused research park. If policymakers are purely hoping to pump out a vast quantity of innovation in the form of new products, they should focus primarily on developing a diversity of businesses and corporations in cities, and also figuring out ways to encourage face-to-face contact that is valuable to knowledge spillovers. However, this research does not measure the quality of innovations, and thus should not be taken at face value. Further research could incorporate the quality of innovations in the spatial analysis. In addition, further research could measure how the degree of specialization within research parks affects the amount of innovation created. Feldman, Maryann P., and David B. Audretsch. 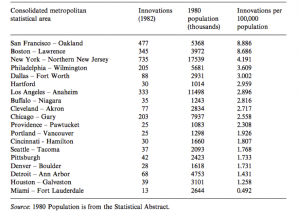 “Innovation in Cities:.” European Economic Review 43.2 (1999): 409-29. Print. Schwartz, Carl J. “Poisson Regression.” Poisson Regression. Simon Frazer University, 7 June 2013. Web. 28 Mar. 2014. <http://people.stat.sfu.ca/~cschwarz/Stat-650/Notes/PDFbigbook-JMP/JMP-part025.pdf>. Skyscrapers have received little attention from urban economists in the past according to Helsley and Strange (2008). What has been discussed relates to their place in the standard urban model, otherwise known as the monocentric city model. In this model, skyscrapers are attributed to the phenomenon of increasing land prices as one approaches the city center. Due to these higher prices, buildings are built up in order to save land costs. In their study, Helsley and Strange (2008) argue that higher land prices are not the only reason for the stratospheric height of these manmade marvels. To builders, the height (and relative height) of their building carries importance for issues of publicity and pride. In order to capture this importance of building the highest building in any market, the study uses game theory to simulate a skyscraper building contest and then continues on to explain an equation that models overbuilding. Building profits are still a determinant in the builder’s payoff function (as they are in the monocentric city model); however in this particular case whether or not the builder has succeeded in constructing the tallest building becomes part of the function as well. They describe their model as an “all-pay auction” (Helsley and Strange, 2008). That is, builders spend their resources and he or she who bids the highest takes the prize. This prize does come at a cost; its value is partially diminished through the bad economics of skyscrapers. The article proposes two situations: simultaneous and sequential construction. In the simultaneous game theoretic model, no contestant gains any value from competing in the game except for the builder who constructs the highest skyscraper. He or she will enjoy the value of this prize; however dissipation occurs for reasons that will be discussed. In the sequential model, the cost comes before construction “where the leader builds a tall-enough building to deter competitors” (Helsley and Strange, 2008). They use the story of the Empire State Building as evidence for this model. The model first introduces a situation in which two risk-neutral builders exist, i = 1, 2. Both builders own land on which to build, however we assume that builder 1 possesses a better location. The variable represents what Helsley and Strange (2008) call a “pre-emption”; that is, “if a rival builder j chose height , builder i would concede the contest because it would never be in the builder’s interest to choose a height that would win”. In other words, when . This expression also explains the prize dissipation experienced in a skyscraper contest. The contest payout will be less than the profit-maximized payout as shown above. In the following two games, is assumed to be less than . This is because there would be no competition in the market otherwise. In the sequential model, is chosen sequentially. The model proposes that builder 1 goes first with the strategy to choose a height such that so that builder 2 will surrender to building at his profit maximization height . His or her pre-emption will not surpass builder 1’s actual building height. If builder 1 chooses a height such that , the equation still holds because builder 2 will continue to build at his or her profit-maximizing height since this will win the competition and be economically rational. If then builder 2 will just top builder 1’s height in order to win the competition. Therefore, Helsley and Strange (2008) propose it is better for builder 1 to win the contest by surpassing to achieve . In the sequential game theoretic model, a significant cost is the choice to build high enough that no other competitor will choose to build higher. This can lead to overbuilding, which will be discussed later. Helsley and Strange (2008) then differentiate with respect to h_i , resulting in . The expected building height can be calculated by integrating by parts the derivation of this equation. The equation is set up as . , knowing . Through this equation, it is easy to see that overbuilding occurs. Expected building height, E[h], is greater than profit maximizing building height h* (the expression in brackets remains positive as π(h) is decreasing on the interval [h*, h_P ] according to Helsley and Strange (2008)). Helsley and Strange (2008) present new work in the study of these urban marvels. They come to the conclusion that skyscrapers are not economical when they are built in a contest to reach the highest altitude. Their research includes plenty of historical data, citing stories of the construction of many of the world’s tallest skyscrapers. Some of them, such as the Burj Dubai, fulfill the proposed overbuilding prophecy. It has been hard for them to find enough tenants for their space. The game theoretic model alerts builders of the poor economics of building for height. The authors stress that this can impact the real estate market and its cycles, contributing to “increases in vacancies and declines in rents, leading to subsequent slowdowns” (2008). In fact, they cite that, when built, the Empire State Building, the Manhattan Company Building, and the Chrysler Building brought a whopping 4,000,000 extra square feet of commercial space to New York City (20% of the city’s stock) (2008). Perhaps further research might be done to measure the impact of the construction of a skyscraper on a city’s real estate market. How does it change prices? Also how does pricing within a skyscraper itself change? Robert Helsley and William Strange, 2008, “A game-theoretic analysis of skyscrapers,” Journal of Urban Economics 64: 49-64. When evaluating urban development, one area of interest to many policy-makers is the rate of crime. While much research has been conducted regarding crime rates in the United States, a smaller number of studies have tried to tackle these issues outside of the United States. In their 2011 investigation, Paolo Buonanno, Francesco Drago, Roberto Galbiati, and Giulio Zanella seek to correct this information gap by comparing crime rates in the United States and seven European countries from 1970 to 2008. 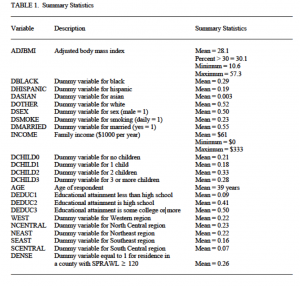 The authors use demographic information, immigration information, abortion rates, unemployment statistics, and incarceration figures as their five explanatory variables for determining levels of crime. The results show that, although crime was higher in the United States than it was in Europe in the 1970’s, since then European crime rates have exceeded crime rates in the United States, a phenomenon referred to as the ‘reversal of misfortunes’ (Buonanno et al. 2011). This paper will analyze the model constructed in their paper, and it will explore potential implications and extensions of their assumptions and equations. 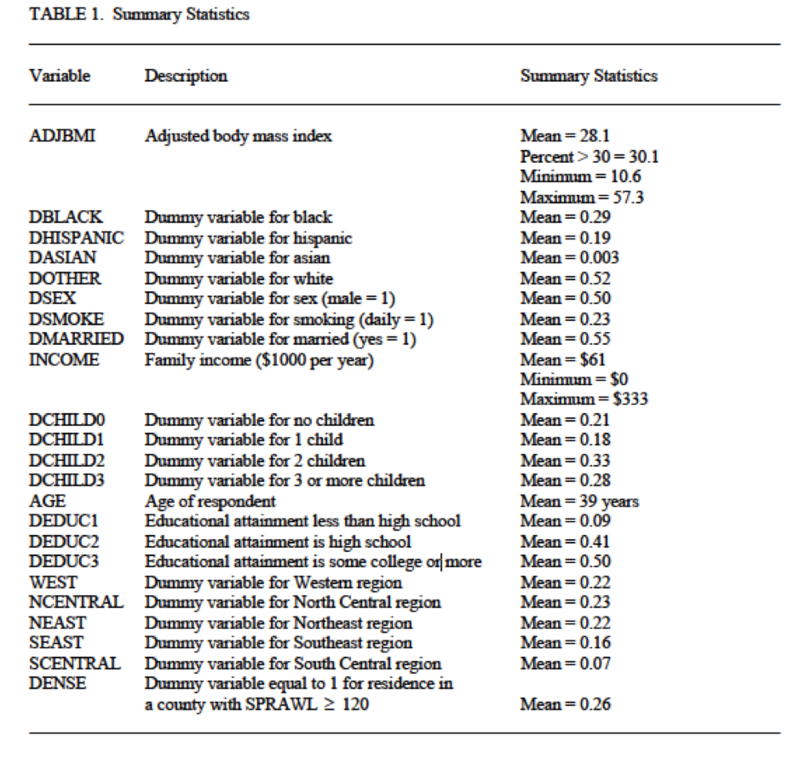 Upon surveying the economic literature regarding determinants of crime, Buonanno et al. highlight five factors as being relevant toward the study of crime rates: demographic changes, incarceration rates, abortion rates, unemployment rates, and immigration figures. Within a demographic structure, for instance, Buonanno et al. argue that young males are more likely to commit a crime than women or seniors. For incarceration, they identify two effects – one effect is that the threat of incarceration deters individuals from committing crimes, and additionally, those who are incarcerated cannot commit more crimes while they are in prison. The authors posit that abortions may have removed from society individuals who would have been more likely to commit a crime due to potential socioeconomic conditions in their families. For individuals who are unemployed, the lack of resources available to them lowers the opportunity cost of committing a crime. Due to age structure and low socioeconomic factors, immigrants are also statistically more likely to commit a crime. Based on these assumptions, the model constructed by Buonanno et al. includes the five aforementioned factors in order to investigate their relevance as measures of poverty in the United States and Europe (Buonanno et al. 2011). In order to implement these factors into a model, Buonanno et al. establish several assumptions regarding the variables. Crime is measured in three categories: total crime, property crime, and violent crime. To categorize Europe as a whole, the study groups Austria, France, Germany, Italy, the Netherlands, Spain, and the United Kingdom together, since these seven nations account for more than eighty percent of the pre-2004 population (Buonanno et al. 2011). When constructing the equation for the model, one challenge the authors confront is the endogeneity of the variables. If the demographic structure of a population and the legalization of abortion, for instance, are exogenous with respect to crime, incarceration, unemployment, and immigration all have the potential to be endogenous. To account for this, the model utilizes several instrumental variables (IVs) to measure these factors. Amnesties and collective pardons serve as instruments to explain the relationship between incarceration and crime rates, the interaction between oil price and the share of manufacturing in GDP is an instrument for unemployment, and exogenous supply-push components are instruments immigration trends. Lastly, the model includes a measure of country fixed effects and common year dummy variables in order to ensure that the results are country and time specific. To calculate the results, the authors use OLS estimation, as well as 2SLS estimation for the IV analysis (Buonanno et al. 2011). where represents the level of crime (total, property, or violent), is a country-fixed effect, contains explanatory variables for country i at time t (a constant, the share of males between 15 and 34 years old in the population, the immigration rate, the share of potential adults aborted, the unemployment rate, and the incarceration rate), t is a polynomial in time, is a dummy variable for country, and is a dummy variable for common year (Buonanno et al. 2011). For the explanatory variables, the values for each variable is inserted individually in order to evaluate their respective coefficients. Because the natural logs of these variables are used, the resulting coefficients can be interpreted as elasticities with respect to the corresponding rates. In order to evaluate country- specific time trends, the model relies on a quartic trend to explain the independent variables, since quartic trends have been used in other empirical literature as the most effective method for explaining life cycles similar to those evaluated in the variables (Buonanno et al. 2011). Buonanno et al. break down the resulting coefficients of the model into two categories: OLS estimates and IV estimates. The authors warn that one cannot regard the OLS estimates as causal effects due to the endogeneity of incarceration, immigrant, and unemployment with respect to crime. For demographic structure, the effect of age structure on crime is positive and statistically significant with most coefficients exceeding 1.5, whereas the coefficient on abortion is close to zero (Buonanno et al. 2011). When speculating about potential sources of bias surrounding these coefficients, the authors identify the endogeneity of the other three variables as the primary potential source. When looking at the IV estimates, the authors first check the strength of the IVs used in order to evaluate whether or not they are appropriate instruments for the model. Amnesties are very strong as an instrument, with an F statistic that exceeds 10. In fact, during the first stage of the regressions, the estimates show that an amnesty on average reduces the incarceration rate by 13% (Buonanno et al. 2011). Conversely, the instruments constructed for unemployment and immigration are very weak; the authors are never able to reject the null hypothesis of weak instruments for these two variables. The IV estimates continue to uphold the assertion that demographic structure is a significant determinant for crime rates, while abortion rates are found as insignificant for explaining crime as found in the OLS estimates (Buonanno et al. 2011). Since the model serves as the beginning of further study regarding crime trends, it is important to consider what extensions are possible for future analyses. Despite finding mixed results for the variables included, Buonanno et al. affirm that, of the variables included, demographic structure and incarceration rates are both significant toward evaluating crime rates. Breaking down the segment of young men from ages 15 to 34 into smaller segments may narrow down analysis of crime rates even further to a more specific age group. For incarceration rates, amnesties serve as one explanatory instrument, but it is certainly not the only potential instrument to evaluate incarceration. Examining the proportion of prisons at maximum capacity rates of incarceration is a possible alternative angle from which to analyze the effect of incarceration on crime. Additionally, there are additional variables to consider beyond the five primary factors identified by Buonanno et al. Levels of education, for instance, would be a highly relevant factor to explore in future studies, since individuals who do not complete certain levels of education may have a higher potential to commit a crime. Additionally, policy incentives to deter individuals from committing a crime – for example, higher levels of probation, or the prevalence of the death penalty – seem appropriate to cite in further investigations. In their concluding remarks regarding their model, Buonanno et al. posit several policy implications of their work. An important consideration to note is what can and cannot be heavily altered by a change in policy. Demographic structure, for instance, cannot easily be manipulated by new policies, with the exception of family planning laws similar to China’s one-child policy to control the number of individuals in each age segment, which would be improbable legislation for the countries being studied. Factors including in the model such as immigration, incarceration, and abortion, however, are all easily influenced by policy. With the model concluding that abortion was not highly relevant to the reversal of misfortunes, as well as finding instruments for immigration to be weak, focus shifts toward analyzing incarceration. One theory that the authors explore is the notion that incarceration rates may not be set an efficient level, since incarceration is proven to be highly relevant toward reducing crime. Upon further investigation, however, the authors discard this hypothesis, finding that the marginal benefits exceed the marginal costs of incarceration, suggesting that imprisonment is fixed at an approximately efficient level (Buonanno et al. 2011). For variables to consider in the future, such as education or incentives to deter crime, if these variables were found to be highly relevant for predicting crime rates, the findings would highlight devoting resources toward increasing education and creating incentives against crime as strong solutions to lower crime rates. In their study of crime rates between the United States and Europe, Buonanno et al. seek to identify the principal factors influencing the ‘reversal of misfortunes’ that has caused crime rates in Europe to exceed similar rates in the United States. The authors focus on demographic structures, immigration rates, unemployment figures, abortion rates, and levels of incarceration as the five main factors to analyze in both the United States and Europe. Using OLS and IV estimations, the results show that demographic figures and incarceration rates are relevant variables for predicting crime levels, while abortion is an insignificant factor in their model. Based on the instrumental variables constructed, there is insufficient evidence to make conclusions regarding the relevance of immigration and unemployment as variables in the model. Though the findings presented in the model do not properly establish in-depth, causal effects regarding its variables and its outcomes, the study serves as a starting point for further postulation regarding appropriate policies that would mitigate the most prevalent determinants of crime. Buonanno, Paolo, Francesco Drago, Roberto Galbiatim, and Guilio Zanalla, 2011, “Crime in Europe and in the US: dissecting the “reversal of misfortunes,” unpublished ms. Outrage over Real Estate Cycles: Across countries, it is a commonly held view that real estate cycles are the product of speculation – when speculation drives up demand, prices skyrocket and vice versa. However, it is in the nature of real estate prices to fluctuate on a cyclical basis. In reality, housing prices also depend not just on speculative demand, but also heavily on supply and interest rates. The model put forth by Malpezzi and Wachter examines the impact of speculation and housing supply on price and volatility. The Fundamentals of Asset Pricing: If we view housing at an asset, value is then based on the flow of services yielded over time. Thus, the value of a home is equivalent to the expectation of profit from rent over time (controlling for interest rates). • c: cap rate: the rate of return on a real estate investment property based on the expected income the property will generate. • So what is Speculation? The clever cheeky definition given by Malpezzi and Wachter is two-pronged: (1) If I purchase a home, it is investment but (2) If someone else buys, its speculation. So if not a synonym for investment, then what is speculation? o It depends on the time-horizon: rather than buying and holding, a speculation is a case of short-term ownership. Short-term ownership is defined as an ownership period in which the owner does not develop or make use of the property. Instead, the owner holds the property vacant in anticipation of a price increase and profitable sale. • The key is to obtain optimal timing. o Was their arbitrage involved? Arbitrage is easier to achieve in thick/liquid markets. A thick/liquid market is characterized by transparent pricing, many market participants (home buyers and sellers), as well as lots of information on prices and the market in general. On the other hand, thin/illiquid markets are characterized by price volatility and costly information. Thus, a higher amount of participants yields greater market stabilization. This is somewhat intuitive: when there are less participants in the market the official “market price” becomes less established and house prices depend more on each individual’s pricing range. • However, it is important to note that an influx of ill-informed market participants actually contributes to destabilizing the market; these new entrants are generally more willing to overpay because they are engaging in short term investment. o Expectations must be inaccurate: inaccurate expectations also lead to overpaying/underpaying or overpricing/underpricing for homes. o Investors often speculate on a continuation of the past high rates of price appreciation. A housing bubble occurs when formulation of subjective probabilities based on the low likelihood of market collapse creates disaster myopia, in which the probability of low frequency shocks is not factored into the decision-making of market participants. Rational investors will be willing to invest and purchase a home overvalued by quantity b_t as long as b_t is expected to grow at a greater rate than that of interest rates. Serial correlation of price increase is necessary for the formation of housing bubbles. Under an elastic supply case: housing supply expands rapidly to accommodate increases in demand, therefore prices stay relatively constant. Malpezzi, Stephen, and Susan M. Wachter. “The role of speculation in real estate cycles.” Journal of Real Estate Literature 13.2 (2005): 141-164.